I start out every one of these by saying, Iron Fist is arguably my second favorite superhero character of all time. (This is going on longer than I anticipated, so I’m running out of different ways to write that.) Why is he one of my favorites? Probably because of Claremont and Byrne, who were two of the best creators working in comics at the time, and they were making great comics starring this lovable Kung-Fu lug. Plus he has a cool costume, a cool tattoo, and he kicks people in the face. That’s better than that punk Superman. 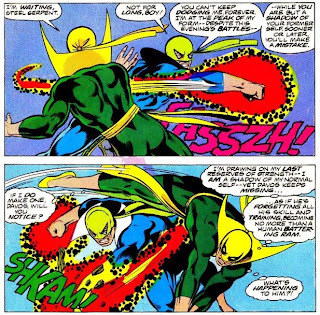 Previously, on Back Issue Ben: Danny Rand was raised in the mystical city of K’un-Lun learning the deadly martial arts, until he rose to the exalted position of Iron Fist, by wrestling a dragon. Harold Meachum, responsible for the death of Danny’s parents, is dead. His daughter, Joy, blames Iron Fist for his death. Iron Fist continues to acclimate to modern life, and grow closer to private investigator Misty Knight. Together with his best friend, samurai Colleen Wing, they get into all kinds of wacky adventures. 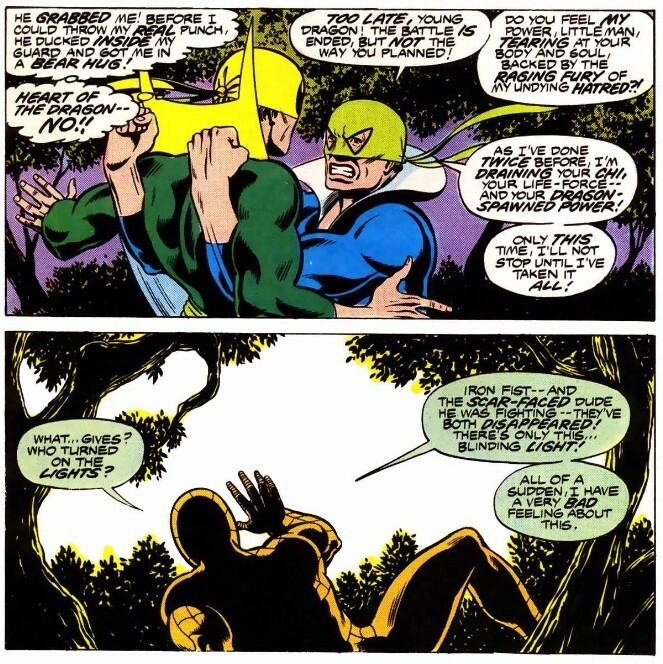 Recently, Iron Fist has been getting attacked by a mysterious stranger, who steals a bit of his life energy with every ambush. Everyone on the same page? Is anyone even reading this? Bacon is great. Iron Fist is great. 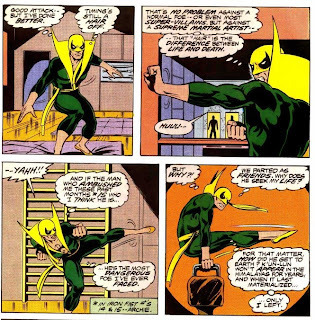 Go grab some bacon, and let’s read some Iron Fist. It’ll be great. Iron Fist trains, trying to regain any edge he feels he may have lost since leaving K’un-Lun. He ponders the mysterious attacker that has been ambushing him the past few months. After his training session has ended, a knock on the door brings Bugle photographer Peter Parker, there to do a photo-spread on the Rand house. Peter had noticed a scroll stuck in the door, and hands it to Danny Rand. 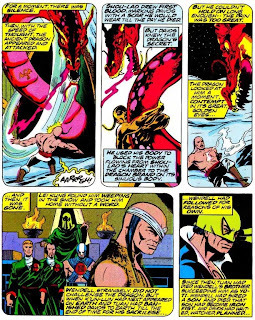 The scroll is a formal challenge to Iron Fist, to engage in single combat to the death, from someone named the Steel Serpent. Danny makes a quick excuse to Peter Parker and leaves in a hurry. Peter, sensing something is up, changes into his Spider-Man costume and trails him. On a yacht on the west bank of the Hudson River, Misty is still working undercover as the gangster Bushmaster’s girlfriend. 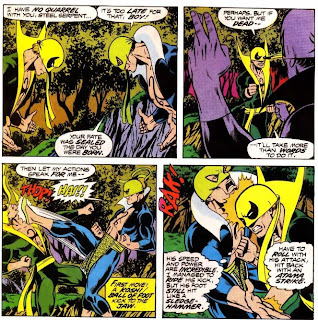 She overhears him talking on the phone about the elimination of Iron Fist, causing her to break her cover and threaten him to tell her where the hit is going down. 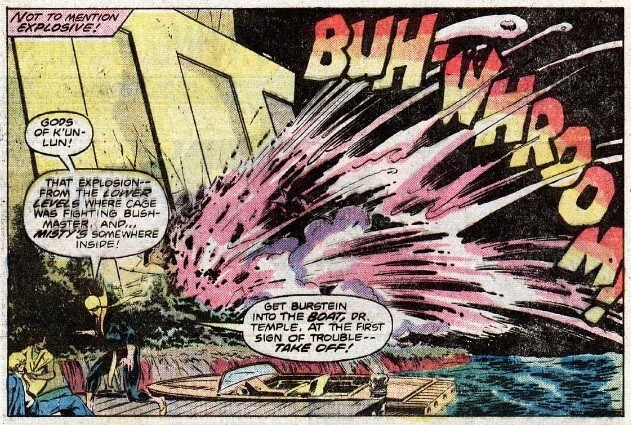 She escapes on a smaller boat, and rushes to save Iron Fist. 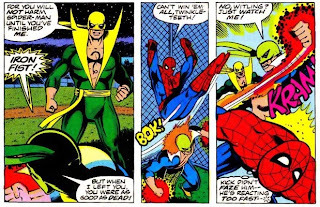 Spider-Man loses track of the cab carrying Iron Fist, but finds out from the driver that he dropped the guy off at the park. 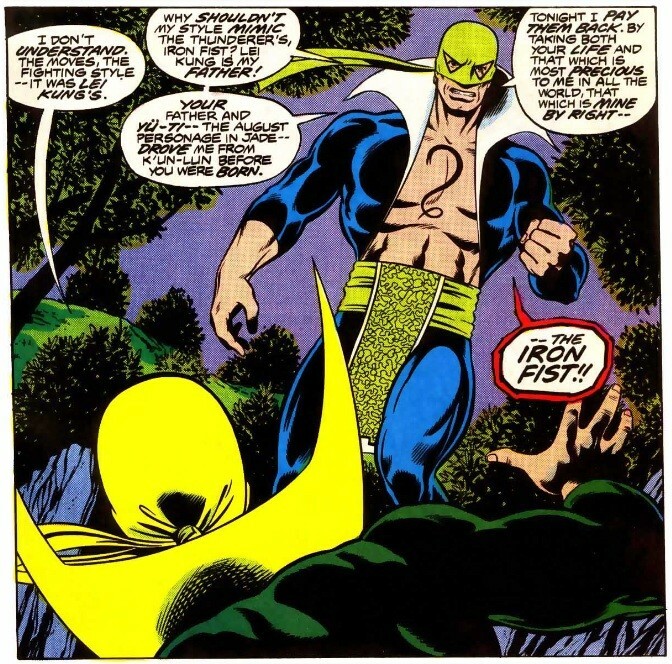 Iron Fist arrives at the park expecting to find Lei Kung the Thunderer, based on the attacker’s fighting style. Instead the Steel Serpent reveals that Lei Kung was his father (remember that clue from all those issues ago? ), and that Wendell Rand and Yu-Ti had driven him from K’un-Lun before Danny was even born. He considers the power of the iron fist rightfully his, and he intends to take it. Iron Fist is barely able to keep him at bay. Spider-Man finally arrives and is promptly used as a baseball bat against Iron Fist, before being flung against a tree. 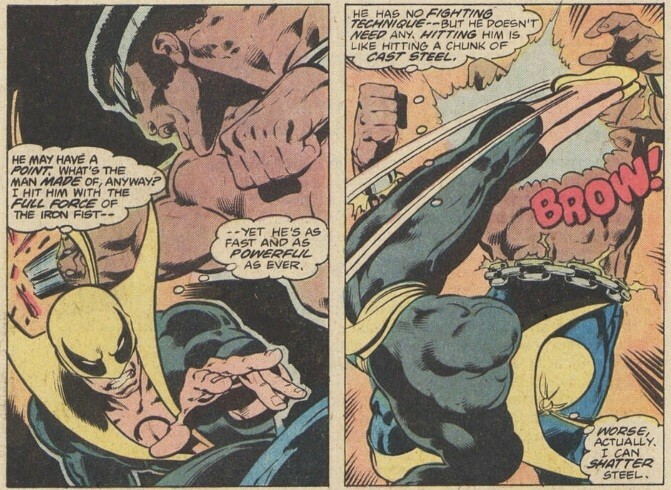 …and finishes the process he started months ago, by draining Iron Fist’s chi, along with the power of the iron fist. 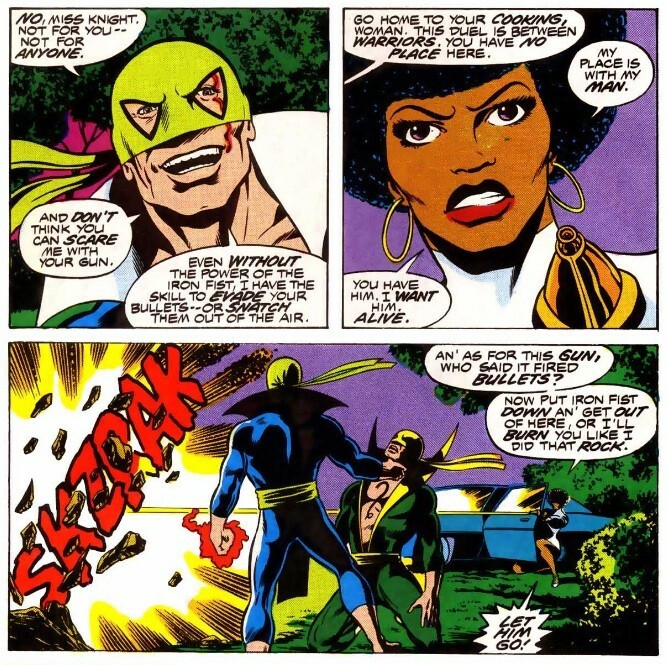 Steel Serpent prepares to finish Iron Fist off for good, but Misty arrives and threatens him with some fancy ray-gun. 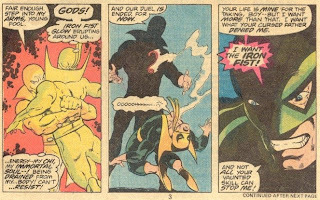 Steel Serpent lets the unconscious Iron Fist go, and then leaves, vowing to end both of their lives before the night is through. Misty runs to the man she loves and cradles him in her arms, as he lays there slowly dying. 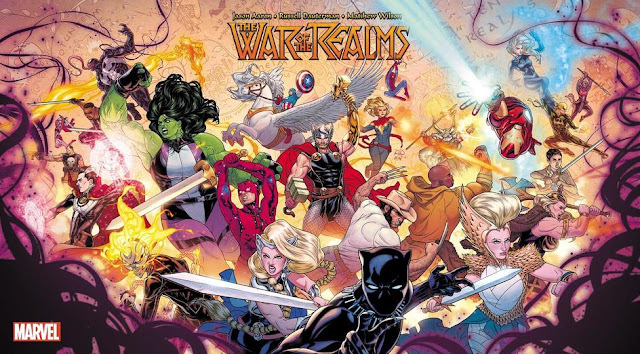 My brain thoughts: Don’t let the title of the comic fool you, there isn’t much of a team-up happening here. 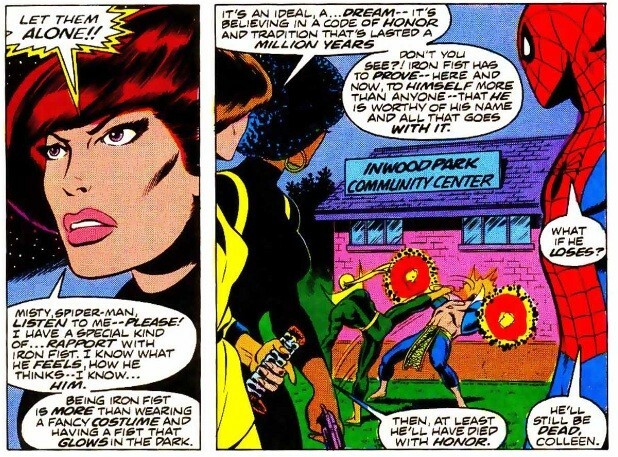 Normally, I’d be all excited about my two favorite characters, Spider-Man and Iron Fist, teaming up, but this was clearly a chance for Claremont and Byrne to finish up a dangling plot thread from their cancelled run on the Iron Fist book. 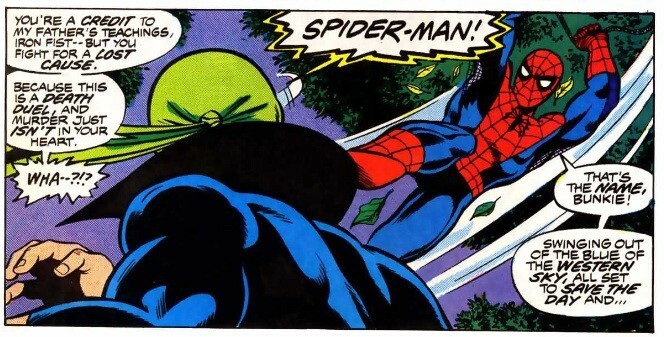 Which is okay, but I just hate to see Spider-Man treated like a chump in a battle. 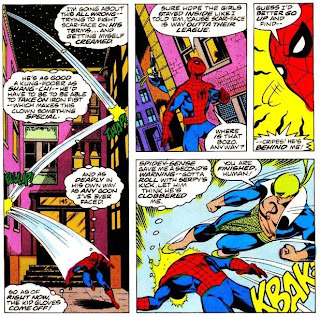 I don’t care how incredible your Kung-Fu is, you’re not catching Spider-Man in midair and swinging him around like a Louisville slugger. That minor nitpick aside, this was another well done Iron Fist story by the dynamite team of Claremont and Byrne. 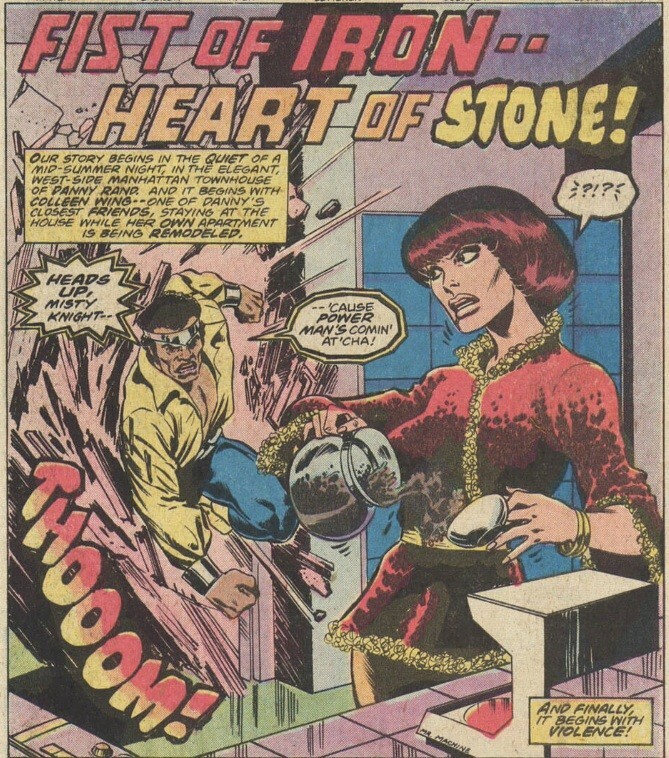 Iron Fist rests at Colleen Wing’s apartment, under the watch of Misty. A doctor sent over by Jeryn Hogarth checked him out, and find nothing physically that should be causing him to die. Misty finally reveals her true feelings for Danny, she loves him. He wakes up long enough to tell her that he loves her too. Misty and Colleen prepare to go out after the Steel Serpent, with Spider-Man in tow. Steel Serpent recalls the events of his life that have led him to this point. He began as Davos, son of Lei Kung the Thunderer, and in his mind, the one destined to become the Iron Fist. However, Wendell Rand-K’ai (firstborn son of the Yu-Ti of that time) defeated Davos in head-to-head combat, earning the right to face Shou-Lao the undying. Davos refused to accept his defeat, and snuck out to face the dragon himself. He did not succeed, and left with a scar across his face, instead of the power of the iron fist. Davos was banished to Earth, with Wendell following behind him for unknown reasons. Misty and Colleen join in on the battle. Steel Serpent escapes to a nearby baseball field, and then goes back on the offensive. Out of nowhere, Iron Fist appears, back on his feet. They fight again, this time Davos appears to be fighting more wildly than the last time. Spider-Man moves to help, but is stopped by Colleen. She figures that, for better or worse, this is Iron Fist’s fight. “He’ll still be dead, Colleen.” Spider-Man being all logical. 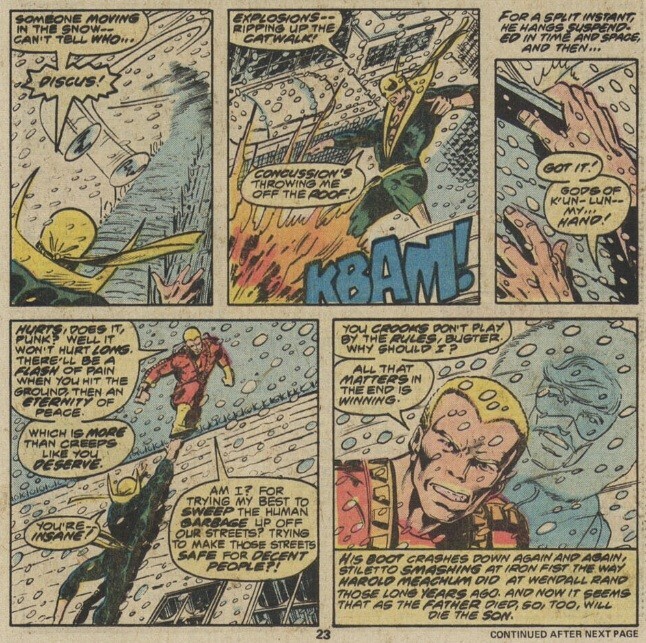 The fight continues, until Davos begins to burn with fire, as the power of the iron fist consumes him. 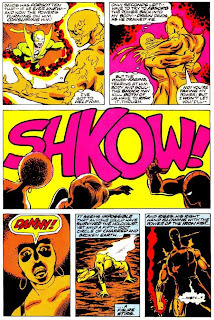 Iron Fist grabs him in a bearhug, and there is an explosion. When the light fades, Danny is restored as the Iron Fist. The man she loves saved, Misty and Danny share their first kiss. 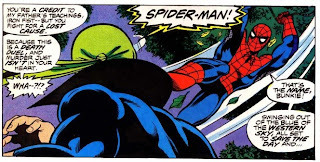 Spider-Man asks what happened to the Steel Serpent. 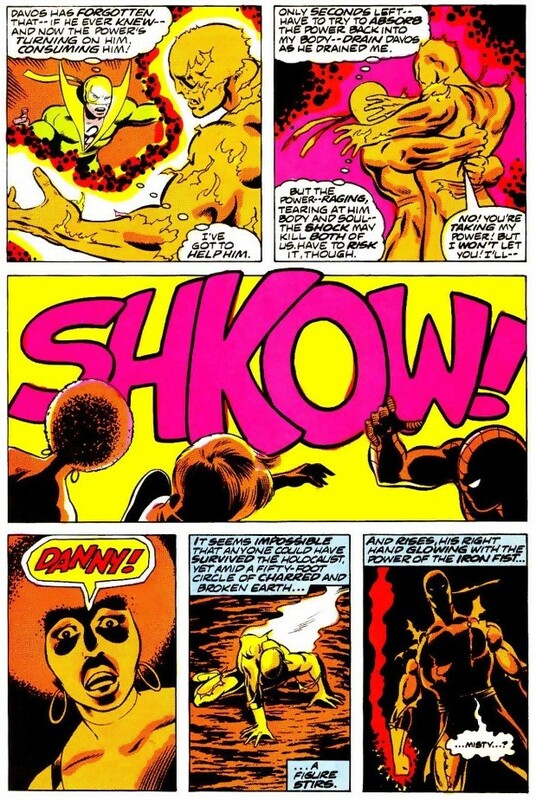 Danny believes that the unchecked power of the iron fist consumed him. He was not worthy of the power. An epilogue sees Lei Kung watching the events that just transpired through they crystal. Yu-Ti enters and expresses sorrow for the death of his son. 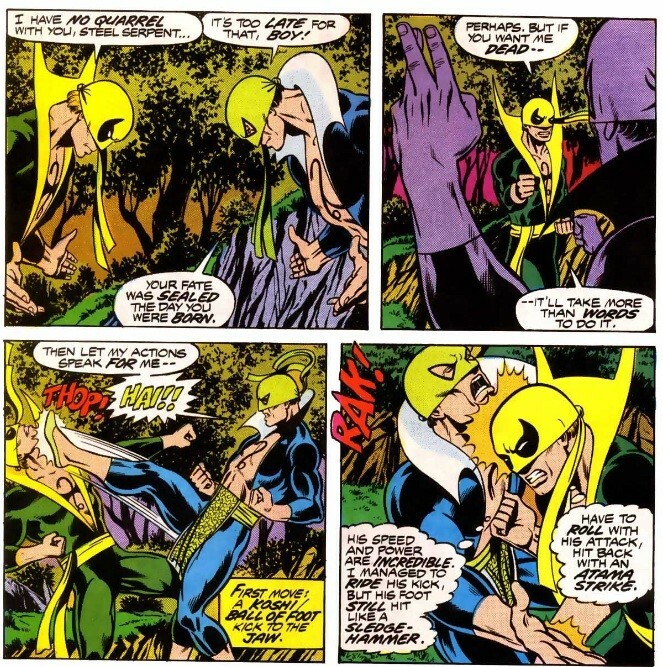 He also feels ashamed for hating Danny Rand, afraid that he would one day return to K’un-Lun and take the throne from him. He realizes now that Danny’s life is bound to Earth. Colleen is staying at Danny Rand’s house while it is being remodeled. 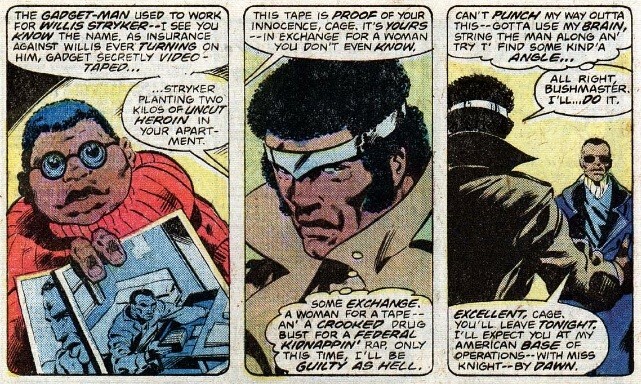 Suddenly, Luke Cage comes busting through the back door looking for Misty Knight. Colleen tosses her hot coffee in his face and runs. She is able to use her speed and agility to evade him long enough for her to barricade herself in a room and call Misty. Luke Cage cuts that short when he comes bursting into the room. Danny and Misty are having dinner when she receives the call from Colleen. They go rushing off to help. Outside, two thugs named Commanche and Shades keep an eye on things. 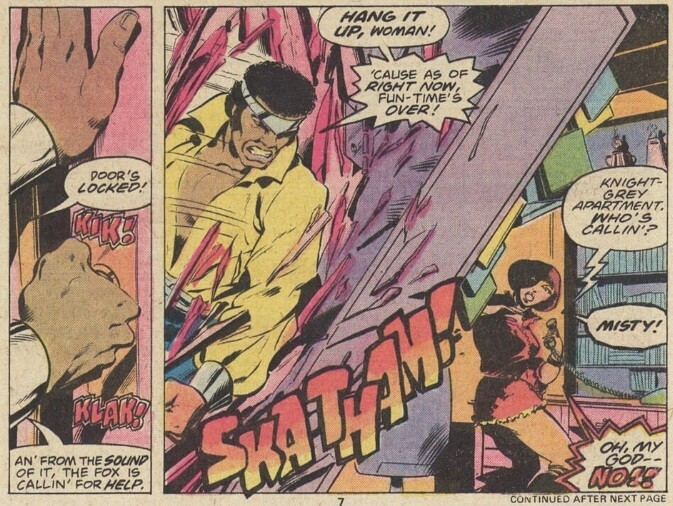 Inside, Luke Cage patches up the injured and unconscious Colleen. Misty arrives and silently enters through the front door. 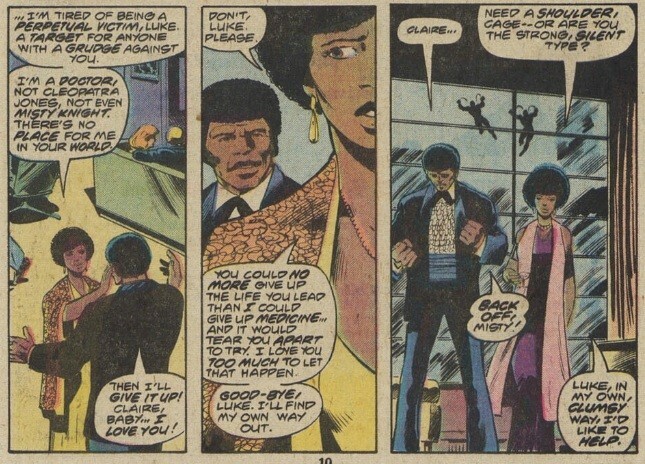 Not silently enough though, as Luke Cage comes to greet her. She tries shooting him at first, and then decking him with her bionic arm. Luke grabs her and throws her against the wall, knocking her out. Unknown to him, a very angry Iron Fist approaches from behind. And lets loose with the full power of the Iron Fist, sending Luke Cage flying out of the house across the street, and into the buildings on the other side. 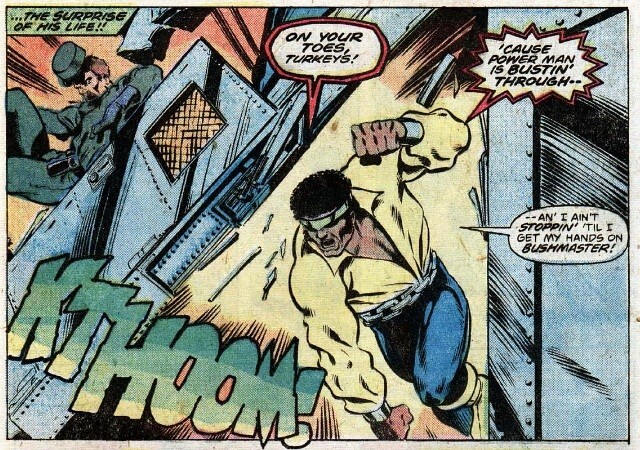 Shades and Commanche split, sending Luke Cage into a furious rage. 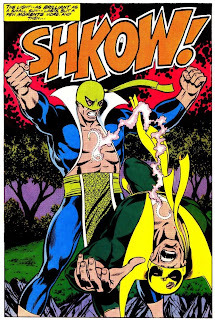 He attacks Iron Fist. 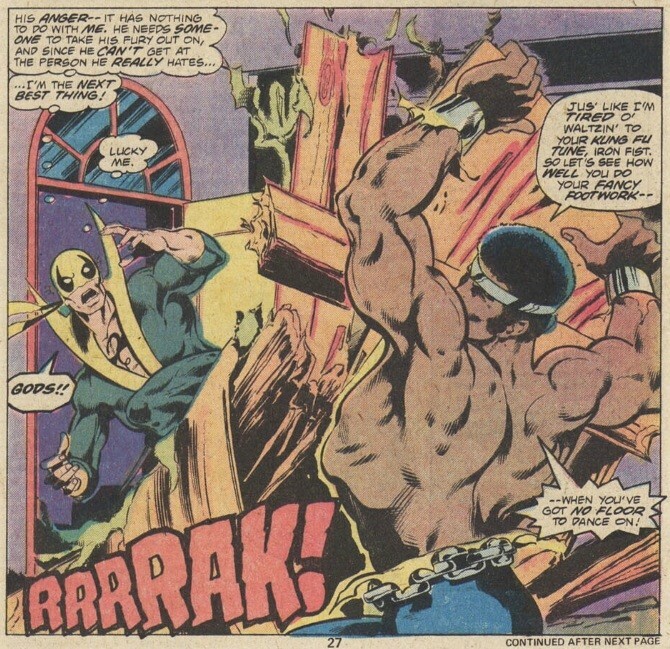 Luke Cage begins to choke Iron Fist, and Iron Fist gambles that Cage will snap out of his blind rage before he kills him. The gamble works, and Cage backs off. Iron Fist demands answers, but the only thing Cage will say is that he may have just killed the two people closest to him in all the world. 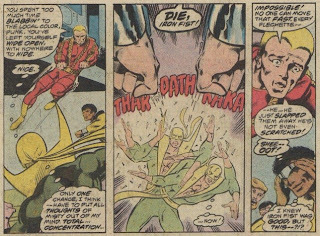 Iron Fist and the others try to question Luke Cage, to get a reason for his attack. He relents, and begins to tell his story, while Misty sneaks into a nearby room to use a computer. Luke Cage continues his story. He was called in for a meeting about a job with a man named Bushmaster. 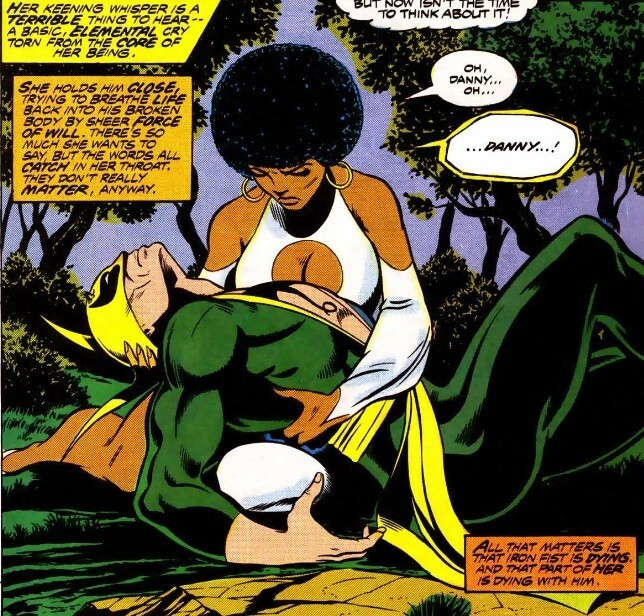 He wanted Luke Cage to kidnap a woman named Misty Knight, and bring her to him. As incentive, he kidnapped Noah Burnstein and Claire Temple, the two people most important to Cage in the world, and threatened to kill them if Cage didn’t do as he said. 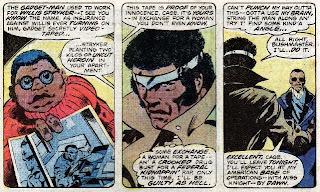 As even more incentive, he revealed that he has hard evidence clearing Cage of the drug charges that put him in prison in the first place (all the way back in POWER MAN #1). 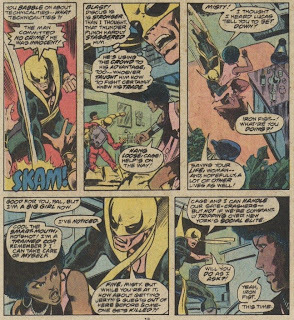 Luke Cage comes in by boat, while Misty and Iron Fist make their way in on gliders. They sneak in the back, taking out guards, and freeing Claire. Cage comes busting in through the front door. They all make their way through the prison, taking down Bushmaster’s men in the process. 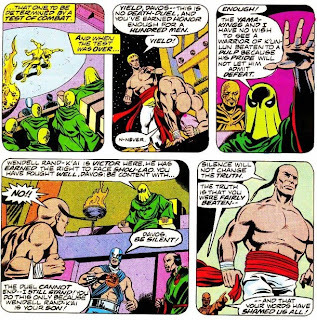 Iron Fist takes care of Commanche and Shades, finding Dr. Burnstein in the process. Unfortunately, Dr. Burnstein had just finished giving Bushmaster powers just like Luke Cage. 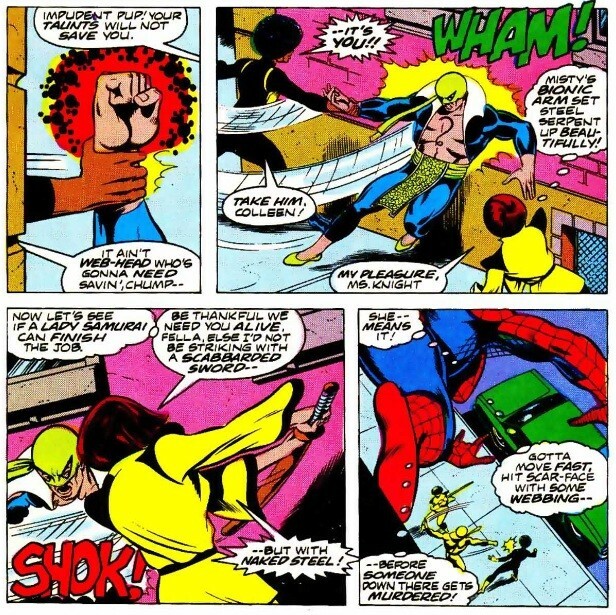 Luke Cage takes on Bushmaster, while Iron Fist escapes with the doctor. The doctor pleads with Iron Fist to help Luke, but Iron Fist knows that, just like his fight against the Steel Serpent, this was a fight that Luke Cage needs to win on his own. During the fight, the chemical vat is pierced, dousing the floor with boiling hot liquid, which hits one of the main power lines, causing a massive explosion. Iron Fist, having evacuated Claire and the doctor outside, goes looking for Cage and Misty. He finds Cage in the wreckage, and Misty arrives soon after with the evidence proving Cage’s innocence. They leave the island, wondering about the final fate of Bushmaster. 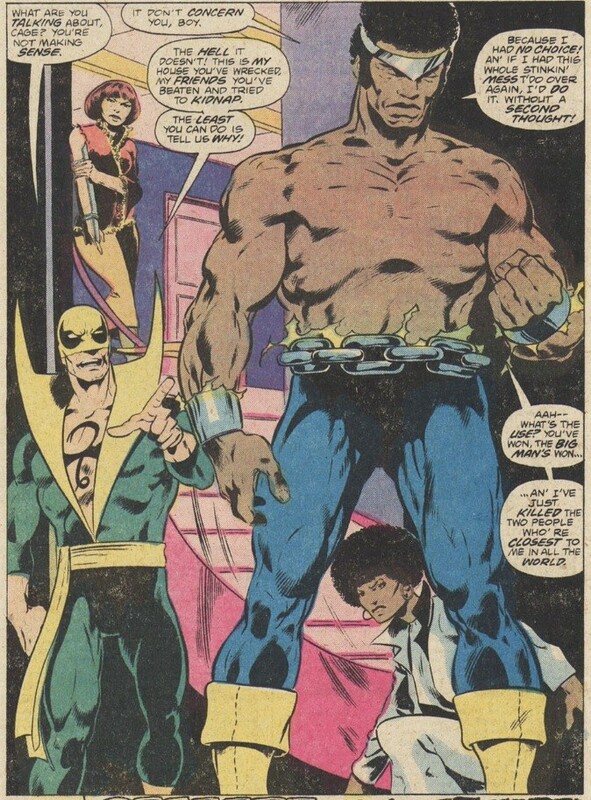 My brain thoughts: A satisfying two-part story that would wind up having much significance on the histories of both Iron Fist and Power Man as characters. 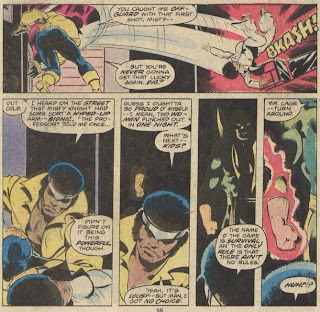 Just like the story in Marvel Team-Up was an ending of sorts for Iron Fist, this seemed like the closing of a chapter in the life of Luke Cage (I assume, I never have read much of the series before these issues) now that he has evidence to clear himself of all criminal charges. What’s next in the lives of these two stalwart heroes? Let’s find out…right now! Luke Cage celebrates finally being cleared of all criminal charges, at a party thrown by his lawyer Jeryn Hogarth. 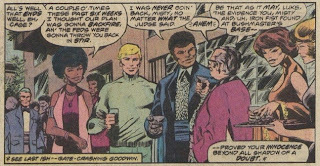 He also had his name legally changed to Luke Cage (formerly Carl Lucas), to symbolically mark the death of his old life. Misty and Colleen extend an offer for Luke to join Nightwing Restorations, their private investigator business. When they get a moment alone together, Luke tells Danny about the events that led to him ending up in prison, and gaining superpowers. His friend Willis Stryker framed him for possession of two kilos of uncut heroin. Sentenced to twenty years in prison, Luke volunteered to be a guinea pig for Dr. Burstein’s medical experiments. Crooked prison guard Rackham sabotaged the experiment, resulting in Luke gaining steel hard skin and super strength. He escaped prison, changed his name, and went to work as Luke Cage, Hero for Hire. Claire interrupts their conversation, wanting to talk with Luke in private. She’s tired of the dangerous life he leads, and of being a target because of that life, so she breaks up with him. Right after that, two costumed goons named Stiletto and Discus come busting through the skylight. Seems they have a grudge to settle with Mr. Cage, and don’t believe that he’s really not a criminal. 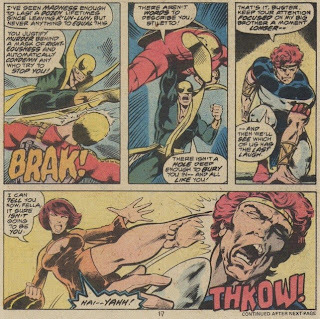 Danny changes into his Iron Fist duds and attacks Discus (at least, I think it’s Discus, I really don’t care…). 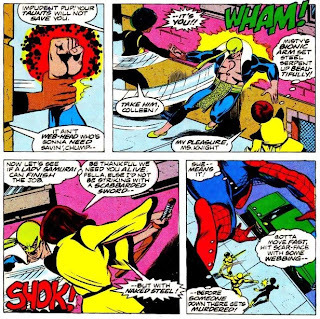 Misty moves to help, but is tackled by Iron Fist. He asks her to help evacuate the guests, but it’s really just to get her out of harm’s way. This doesn’t sit too well with Misty, but she agrees to do it anyway. Stiletto (what a dumb name, beware the ladies' high heel shoe!) 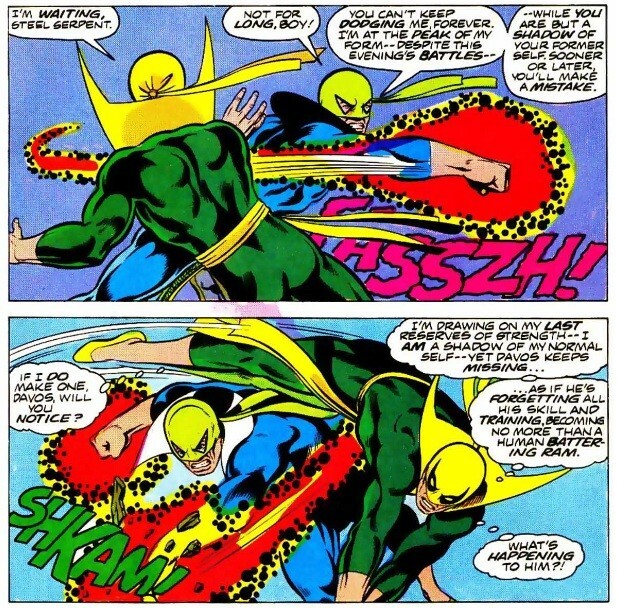 takes aim at Iron Fist, but comes up empty. 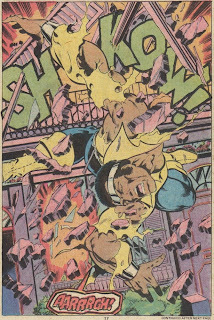 Luke Cage pushes off the rubble, lays a kiss on the lady that was trapped with him, and follows Iron Fist as he chases a retreating Discus and Stiletto. 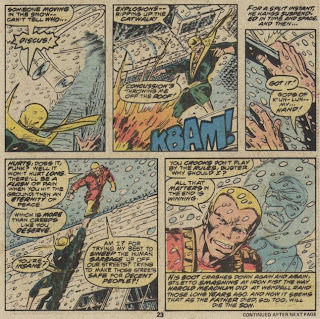 Iron Fist follows them up onto the roof, but realizes his mistake as he loses all visibility in the thick snow. He loses his footing and goes sliding off the roof, grabbing ahold of the catwalk. Stiletto comes along to stomp on his hand, bring back memories of Wendell Rand being stomped on by Harold Meachum. 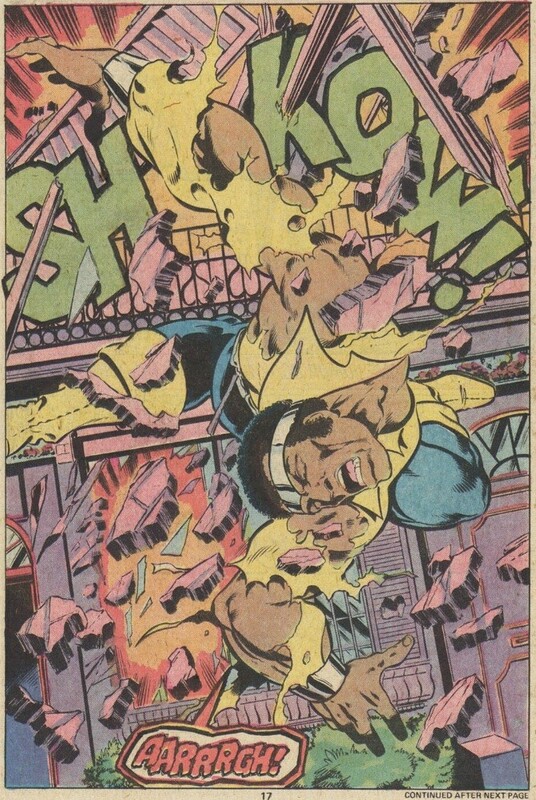 Luke Cage catches up and tackles Discus, but they both end up falling through the roof. 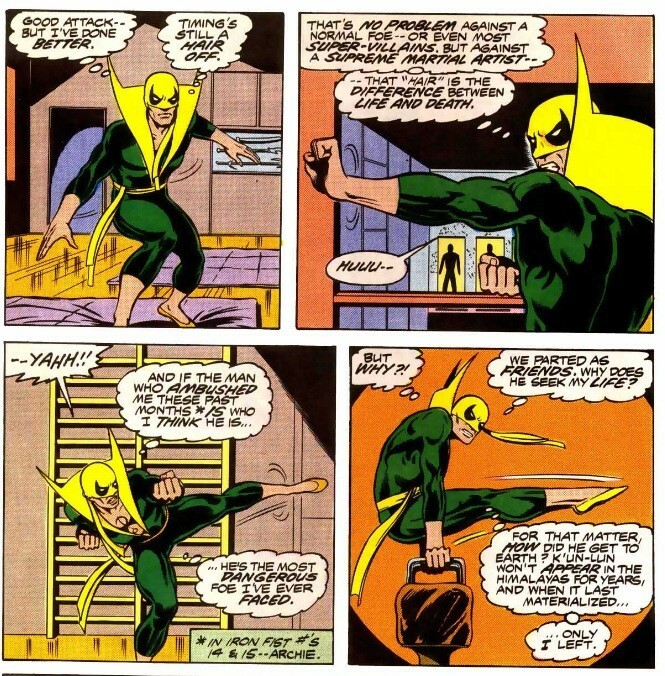 Iron Fist loses his grip and goes flying off the side off the roof, falling to his death just like his father had so many years before. 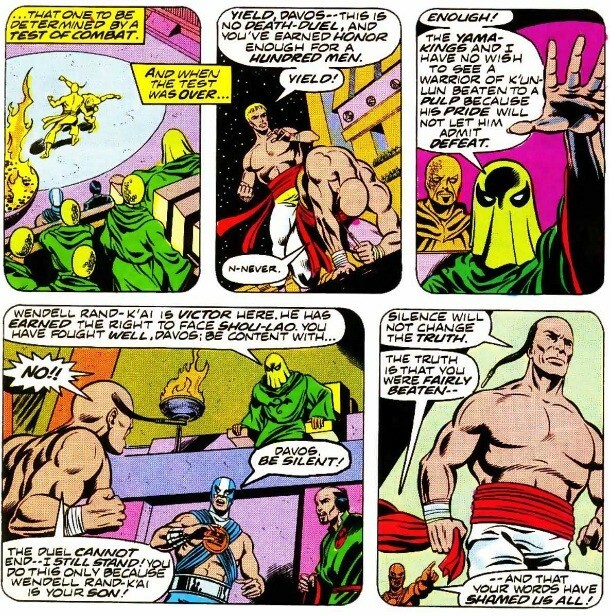 Iron Fist gets his wits in time to angle his fall toward an indoor swimming pool, and survival. 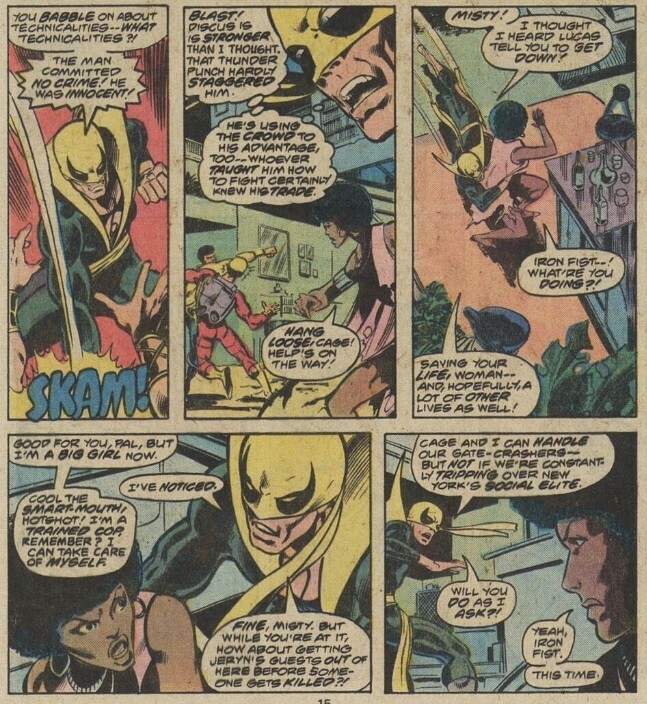 Luke Cage has Discus in his grasp, but Stiletto has his wrist weapon things pointed at him. Misty and Lt Scarfe come busting in, and Scarfe takes on to the chest from Stiletto. Misty fires back, shooting Stiletto in the shoulder. Misty has her gun pointed at Stiletto’s head, ready to fire. Lt. Scarfe had been her partner on the police force when she lost her arm in the explosion. He was the one that applied a tourniquet and saved her life. 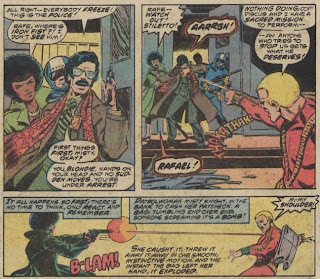 She pulls the trigger, but Luke Cage is able to stop the bullet with his hand, and save her from making a huge mistake. Lt. Scarfe is alive and unharmed, the dart having luckily hit him right in his police badge. Later, Misty, Colleen, and the boys have some drinks together. The twins have been carted off to jail, Misty thanks Luke for saving her, and Luke decides to accept their job offer to join Nightwing Restorations. My brain thoughts: A solid issue that furthered the relationship between the two main characters, as well as Misty and Colleen. The action was good, even if the villains weren’t. 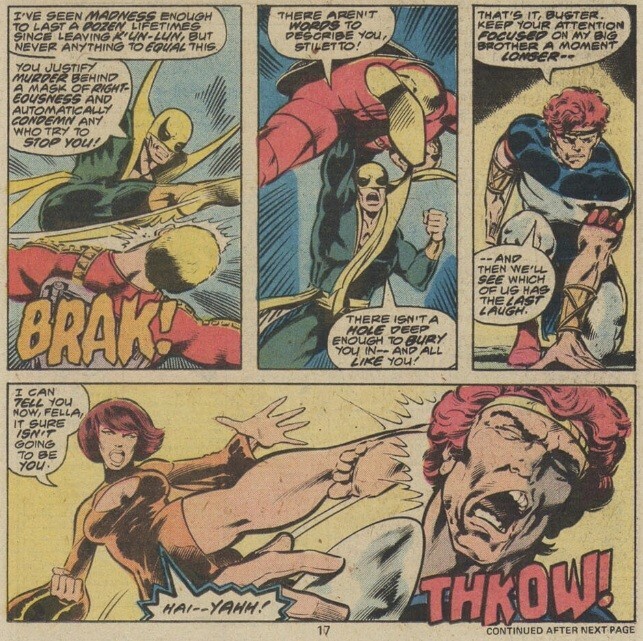 This marks the end of Claremont and Byrne’s run on the character of Iron Fist. They closed out most, if not all, of their story threads, and set him up with a new partner and a new title before moving on. Job well done gentlemen. My final brain thoughts: Villainous high heel shoes, Tobey Maguire-like Spider-Man, endings, beginnings, and Luke Cage never uses a door! Like I said before, it really felt like Claremont and Byrne closed out chapters in the lives of both Iron Fist and Luke Cage. They cleared the deck of all old business, before putting them together as partners going forward in their new shared book. Beginnings and endings, it’s a beautiful thing in superhero comics. 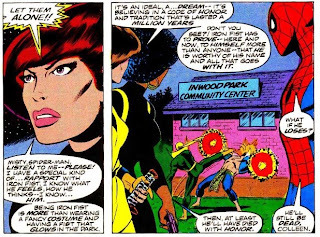 Claremont and Byrne justifiably get lots of praise for what they did while they were on the X-Men, but nobody seems to remember or care about what they did for Iron Fist. They took a new character, told some really enjoyable and wonderful stories, and singlehandedly refused to let him disappear into the ether of cancelled comics. 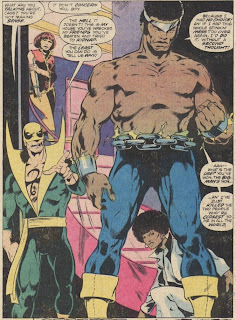 There’s no telling where the character might be today if he didn’t get paired up with Luke Cage. The pair of Iron Fist and Luke Cage, as well as their lengthy comic book run, are still fan favorites to this day. 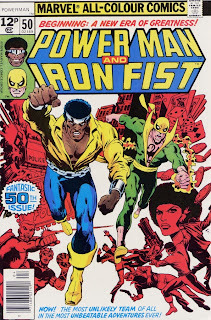 When talk of another Marvel movie or TV series comes up, Power Man and Iron Fist is always a suggestion thrown out there by fans. There is a reason for that. Want to find out why? Come back next time, where I take a look at Power Man and Iron Fist.